From a whole other world, The Alien, is extra-cool with hypnotic colors. 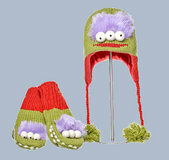 Be extraterrestrial this winter. Match with The Alien Hat. Comes in Adult and Kid's sizes. Send the whole family The Alien! 100% natural wool.